Popsicle season is back! The past week has felt like we skipped spring and went straight to summer, but I’m not complaining. Bring on the heat! Homemade popsicles are my favorite warm weather treat. My kids think they’re getting the best treat in the world and don’t even realize that most of the time, they’re only eating frozen fruit. Popsicles are one thing I never buy from the store. The cheap versions are full of artificial food dyes, which I try to avoid as much as possible. The more expensive versions usually still have a good amount of added sugars. It’s much less expensive to make them myself at home, and I love that I can control the ingredients. 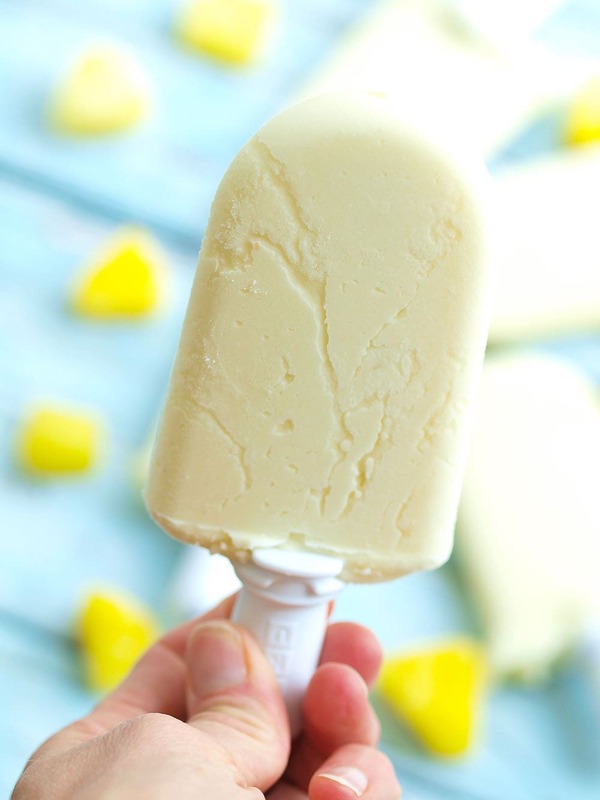 Most of the time, I only use a few ingredients and the homemade popsicles taste even better than what I can buy in the store. You can’t beat the taste of fresh! 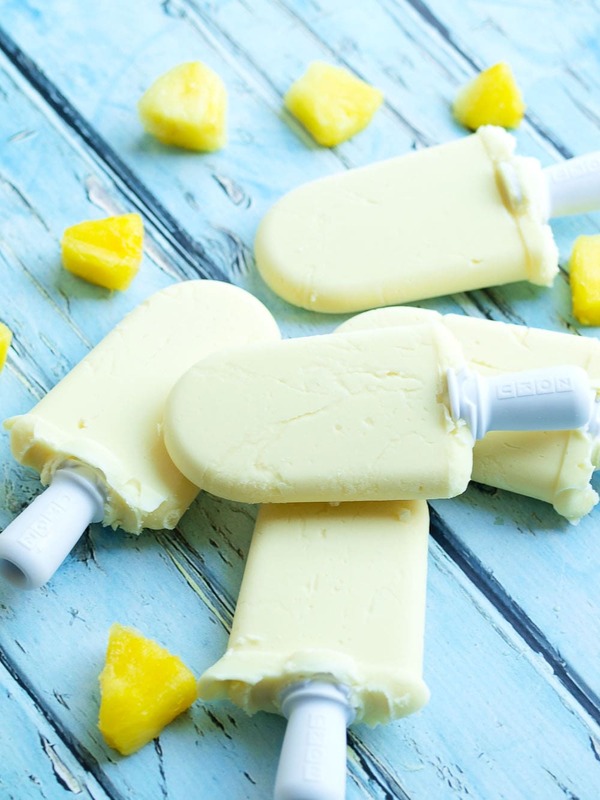 These homemade popsicles are made with just pineapple and coconut milk. The coconut milk gives them a creamy texture without dairy, and the coconut flavor pairs perfectly with the pineapple for a tropical flair. It’s as easy as blending the two ingredients together and pouring the mixture into your molds. Luke helped me make these and was so happy to be a big kitchen helper. What made these even easier for me was my Zoku Quick Pop Maker maker. Last Christmas I got one as a gift and I wish I’d had one years ago! Seriously, guys, it’s awesome. Homemade popsicles with almost no waiting! You pour your liquid in and it’s frozen in seven minutes. Now for kids seven minutes seems like an eternity, but it’s a whole heck of a lot better than having to wait hours for the things to freeze. This recipe makes 12 popsicles. I like having popsicles on hand in the freezer for whenever we want them. 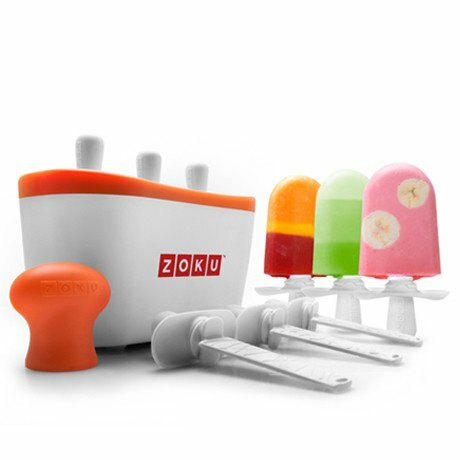 I made six with the Zoku Pop Maker, and 6 with my Stainless Steel Popsicle Mold , which I also love because it’s not plastic. Just adds a bit more waiting time to the equation. Although my kids love these popsicles, they aren’t just for kids. With just 100 calories, these are a perfect after-dinner treat for moms and dads, too! 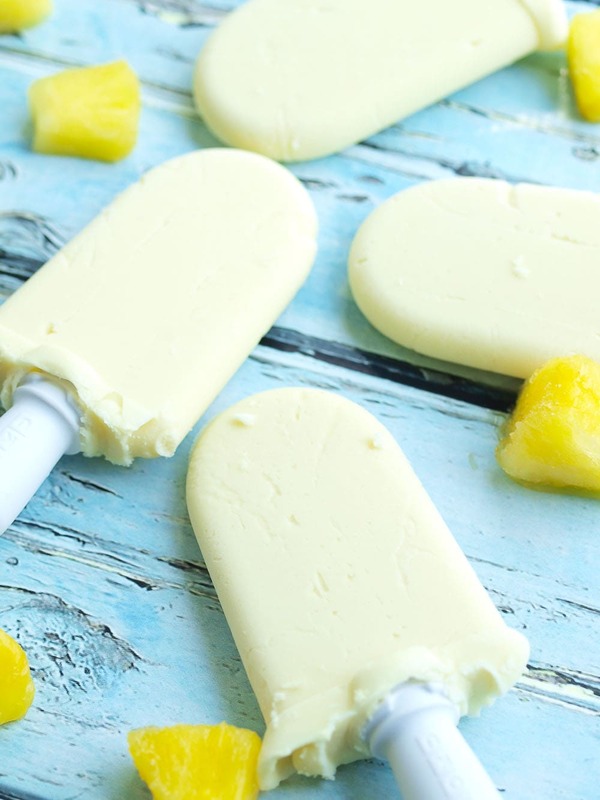 We’ll be eating these 2-ingredient Pineapple Popsicles and my 3-ingredient Fudge Pops all summer long! Just 2 ingredients are all you need to make these healthy homemade popsicles. Vegan and gluten-free recipe. Blend together the pineapple chunks and coconut milk. Pour liquid into your popsicles molds and freeze. Enjoy! This post contains affiliate links. 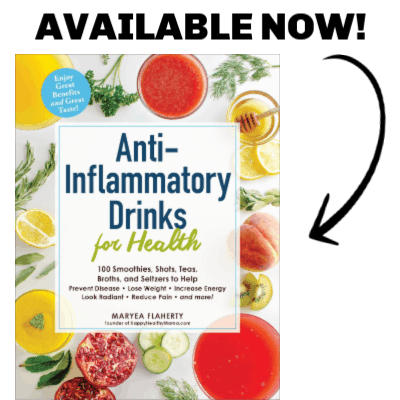 That means if you purchase one of the products through the link, I will receive a percentage of the sale. Thank you for supporting Happy Healthy Mama and making this site possible! So incredibly easy, love these! I have this popsicle maker and I’ve never used it! You need to! It makes it so quick and easy! Wow, this is so easy! But looks so yummy!!!!! I know this is probably frowned upon-but if I use canned pineapple would I add the liquid too or would that make it too watery/mess up the consistency? I would probably do it without the liquid, but I don’t think it would hurt it to add the liquid. You’ll just probably end up with enough to make more than 12. Yes, that’s exactly what I use! These look so good! I need to get myself a popsicle maker stat! 7 minutes?! That’s crazy! Would this recipe work with the coconut milk in 1/2 gallon version or do you really need the canned stuff? I think it’d work with the carton coconut milk, it just wouldn’t be as creamy since that kind has less fat. Let me know how it turns out if you try it! I will. But I think I might try it with the canned first and then the carton just to compare. Thanks!! great Recipe, what brand of Coconut Milk have you found that works the best?? I’ve had good luck with Thai Kitchen organic coconut milk. This was a delicious cheap treat to make. Pineapple $ free from my backyard. Coconut milk $1 from dollar tree. Used my smoothie blender and made in batches and froze them in Dixie cups with Popsicle sticks and a some in an ice cube tray to add to smoothies later on.